Just outside my office window the big jacaranda tree is pushing out its mass of purple flowers. In my garden, dense clusters of Sweet 100 cherry tomatoes are turning a fiery red and the basil leaves are growing almost large enough to consider picking. This is the time of spring in San Diego I love. 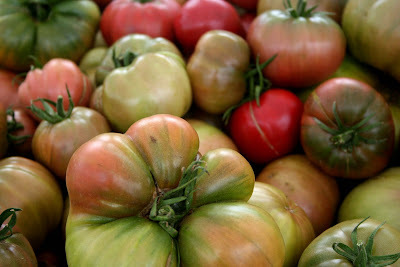 And, it's when a trip to the farmers market means an explosion of color and, of course, flavor. Today's La Jolla Farmer's Market was lit up with a rainbow of gorgeous produce defying the morning's June gloom. 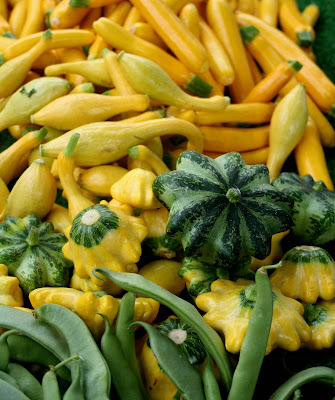 From baby purple artichokes to sparkling Bing cherries, from my favorite yellow and green squash to luminescent zucchini blossoms, the market stalls were ripe for the picking. So, this is more of a photo tribute to what I saw this morning. Think of it as a little incentive, even push, to get you out to the markets and enjoy the current bounty. 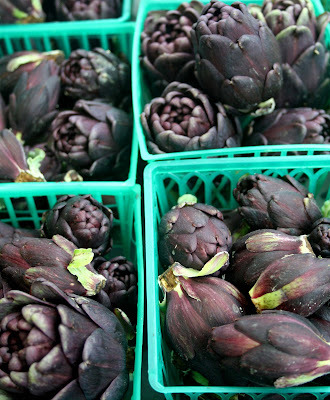 Suncoast Farms from Lompoc has these wonderfully eccentric-looking baby artichokes. 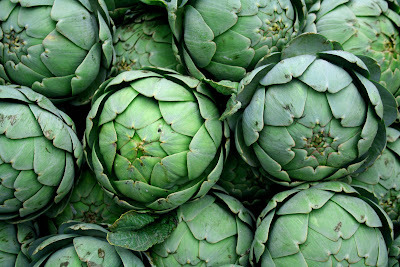 If you're a fan of the packages of baby artichokes from Trader Joe's try these. They're so easy to prepare and really delicious. It's just a matter of stripping the hard leaves from the thistle until you get to the soft ones. You can boil them or--what I like to do--blanch them for a minute or two, then cut in half lengthwise (no need to scoop out the choke since it's so tiny), toss with olive oil, balsamic vinegar, minced garlic, salt and pepper and roast in the oven at about 375, covered for about half an hour and then another half hour uncovered (try adding some grated Parmesan cheese during the uncovered phase). The stand also had some of the most enormous green artichokes I've ever seen, perhaps twice the size of those you see at the supermarket (they're known for these). And absolutely beautiful. Perfect for stuffing. Peterson Specialty Produce from Fallbrook has its bi-color yellow and green squash at the market now. With conventional zucchini I enjoy cutting them into matchsticks and sauteeing them with garlic and lemon juice or grating them for savory pancakes. But these are so beautiful, I think they should be halved (quartered in the case of the round summer squash), steamed and eaten with a vinaigrette or sliced extremely thin and marinated in a flavored olive oil and garlic and served like carpaccio. Or sliced and baked with herbs, oil and a blend of bread crumbs and grated Romano cheese. 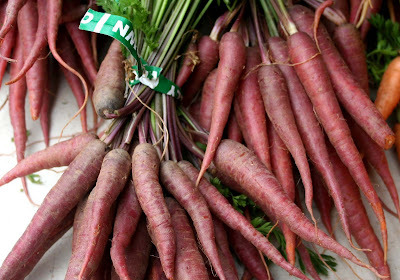 If you love carrots, have some fun with the red carrots from JK Organics in Escondido. They're sweet and such a unique color. I am a big fan of Smit Orchards and look forward to pluot season from them. It's here and I've got a handful waiting to be bitten into. 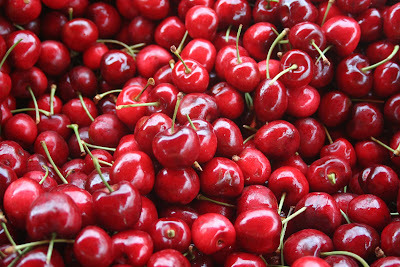 They also have some stunning cherries--both Bing and Rainer--and bushels of blueberries. The big deal for me today was that it was the first day of the season for heirloom tomatoes--and I found these at Valdivia Farms. That blushing big one up front? It's mine, along with a couple of others. I'm going to give them a couple more days to fully ripen and then they'll get sliced and eaten with mozzarella, fresh basil and roasted chili-infused avocado oil that I bought from the Peggy's Pasta stand (along with a dozen organic eggs). 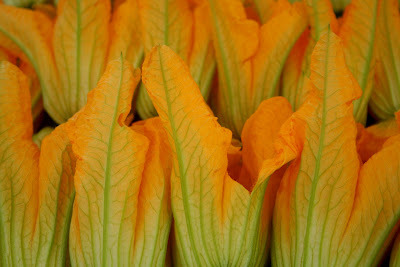 They also had boxes of stunningly vibrant zucchini blossoms. Nothing shriveled up--everything full on healthy and beautiful. 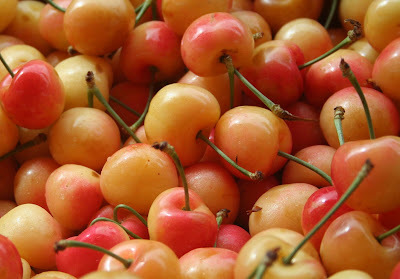 I bought four, attached to their little fruit, and will probably stuff them with cheese and saute in olive oil. With some slices, perhaps, of the fresh garlic I found at the Sage Mountain Farm stand. 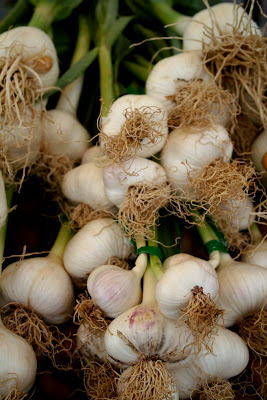 It's not always easy to find fresh garlic at the markets here and I don't know why since they're so easy to grow. But, I saw my opportunity and bought a few. It's a whole different animal than the sad, often yellowing heads you find at the supermarket. And, you can trim the tops, clean them and chop them up to use like chives--garlic chives. 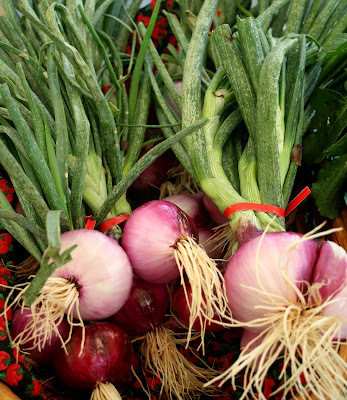 You'll also want to stop by Maciel Farms for their big beautiful greens, fat carrots and these magnificent red onions. The La Jolla Farmers Market is held on Sundays from 9 a.m. to 1 p.m. It's located in the La Jolla Elementary School playground on Girard at Genter.